The amount of books one can buy which tell the tale of authors who suffered and recovered from some seemingly insurmountable illness is climbing steadily, and some even make it into the movies: recently, Brain on Fire described the most deadly of these which the initially wrote off to mental illness rather than the neurochemistry of glutamate. Some books describe the experience of neurologists who slip and fall on icy pavement, some of a neurologist who discovers, after a ride at the fair, how a leg refuses to climb into bed with him. In all of these descriptions, experts who should know better find themselves befuddled by what we call a lack of awareness of deficit, more scientifically known as anosognosia. The experience of this lack of awareness owes its appearance to widespread brain dysfunction, resulting in firstly, a disruption of cognitive self-awareness and appraisal of changes in behaviour, which includes a concreteness that may even lead to paranoia, and secondly, a psychological defence against catastrophic awareness that all hell is breaking loose cortically speaking. In all of the above, a direct brain insult was emerging, which confounded their senses. In this case, Lipska experiences something a little different. Lipska is a Pole who is headhunted to come to America to work on harvested brains, after losing her first husband to melanoma, and marrying a second, only to face the same illness in the form of breast cancer and melanoma, which she beats. But like many, it comes back in the form of a metastasis, in her brain, in the form of three neoplasms, and from the way one is bleeding, the size and placement, it is melanoma. Fortunately, Lipska has two things one requires in the USA in the face of such disaster, and the first is good insurance, the second is access to experimental drugs which they will pay for when therapy as usual fails. As many who have gone through such treatments, the brain possesses a remarkable dislike for being messed with, either by growths or the attempts to persuade them to reverse their growth. It is precisely the response of her brain that Lipska sets out to describe in detail. Along the way she tells the story of her survival, but the journey is paved by a descent into a loss of both cognitive capacity and connection to self-reflect on the changes occurring. She is unable to comprehend what is happening initially, and then later on, before, during and after diagnosis. This includes some snippets of her insight into the brain, lending her knowledge to commentary on the value of primary association areas as well as the prefrontal cortex, where one of her tumours makes its home, hence the neurobehavioral changes her family witnesses and tolerate, albeit with much concern and painful distress. Shielded by her lack of awareness, she is less terror-stricken then they are, even when she is told she is to die unless treatment kicks in. She is however becoming unrecognizable as she progresses through illness and intervention owing to the chemical lobotomy the main and side-effects of the medication are producing, hence the secondary title of the book. What helps to save her is her extreme fitness, even though she is in her 60’s when the illness hits. She tries to preserve this and the ultimate challenge is to do this when the steroid medication is destroying her body. The book is largely a reconstruction of prompted and then recalled memory, as she clouds over during the horrifying experience of losing her mind, and her self-awareness during the process of surviving. She accurately describes the concreteness of her cognitions, and the distancing she feels from her emotions even when her life is in peril and those around her are resigning themselves to her demise. Vast areas of her skills are dissolved, and then reappear, and her life before and after are compared as she emerges. Adjusting to her new normal will take time. The 11 chapters of the book are an easy read. 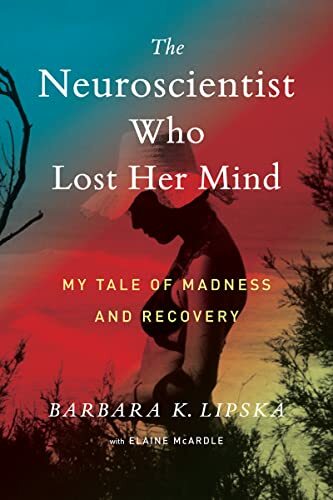 Tom Insel approached her after the first essay on which this book is based appeared in the newspaper, and as the ex-head of the NIMH remarked on what a contribution this would make to the world, an insider’s view of a specialist scientist losing her marbles. The question is, does this book do it? The style in which it is written is really interesting in the opening pages, but an editor might have restructured the sequences of information that follow these first few pages, that are given to provide a more cohesive view of what is happening in the moment. The book loses this style as it progresses, become a simple narrative, and in that I don’t think McArdle has done justice to the power of the struggle Lipska has had to produce to survive. So, until the top of page xiii we are caught up in a true reflection of what being in her head is like, but further on the book, it gets factual, not as personal, weakening the narrative. An important contribution to the book would have been descriptions of what the family saw, not just in Lipska’s reconstruction, but truly reflecting what a family has to go through when someone comes so severely off the rails. No explanation is given as to why she is allowed to drive, when she is so dangerously devoid of visuospatial capacity, or so impulsive and out of control, losing it in the parking lot and on the freeway. These are important if the aim of the book is to educate from within. The book is left thinner than other accounts of such illnesses, and the blame I think might fall in McArdle’s lap as the presumed journalist here. Nevertheless the book is compelling reading, moving quickly across the years of her struggle, and retains your interest in the looming catastrophe, and how the void is avoided. She tells the story without sparing details about her family or her reported failure to stay the distance with her first husband, who would go on to lose his life to cancer. The most important aspect of the book, or at least it seems to me, is her description of the vagueness of her response to the news that there was little chance for her survival, after the cyberknife failed to eliminate her tumours: masked by her brain dysfunction, the threat of death seems somewhat surreal to her. She loses any empathic response to her family’s distress, consumed by the egocentricity of anosognosia. She sees no threat to others in her erratic driving, and her family seems to back off an allow her to continue to drive, although knowing better, as they too are caught up in the unfolding tragedy. An introduction or writing in levels with input from her son, daughter and husband as to what they witnessed and what they survived, would make this book outstanding. It would be no spoiler alert to say she survives, or clearly the book would not have been written. She makes no mention of the risk she still faces for the future, and one hopes her fights have been finally fought and she will be well. And finally there is the encouragement to make sure you are as fit as she is, nurturing brain and body with her fanatical running, continuing as far as she can through the fatigue and brain fog, to keep herself physically active as therapy for both body and brain. A great inspiration, and well done to Dr Lipska.